This Abrasive Wheel safety training programme provides the background safety knowledge required for people who work with abrasive wheels. It gives you an in-depth introduction to abrasive wheels, looks at the different types of abrasive wheel and how to choose the right wheel. It also explains how to check, maintain and store abrasive wheels. This Abrasive Wheel Training course can be completed in just 40 minutes and is the perfect course to support practical training. Abrasive wheels are powered wheels, cylinders, belts or points made from, or coated with, abrasive particles; they are incredibly fast moving, which can make them very dangerous and injuries can be extremely serious. Abrasive Wheel Safety training is therefore essential. In fact, around half of all accidents involving abrasive wheels are due to them being used incorrectly or without the proper controls in place. This course looks at the different types of abrasive wheel and explains how to choose the right one. It then concentrates on safety when handling, using and looking after abrasive wheels; finally covering the legal responsibilities for safety when working with them. This programme concentrates on safety, it does not replace practical training. It does not teach someone how to use abrasive wheels. Use this course to increase your workplace safety, make sure you are setting up and using the abrasive wheel correctly and learn the best practices for maintaining abrasive wheels. Are you an IIRSM member? Enjoy a 10% discount on all of our IIRSM Approved courses! The Abrasive Wheel Safety Training course is broken down into 4 sections. There are many different types of abrasive wheels, each designed to be used in different ways –for example, some are used for cutting, some for shaping, some for removing sharp edges and some are used for cleaning or preparing materials for another process. This section looks at the British Standard System of marking and identifying wheels, including the display of supplier, dimensions, restrictions on use and operating speeds. Since abrasive wheels are used for a great many different tasks on a wide range of materials they vary hugely in their specification. Selecting the right abrasive wheel for the job is important – getting it wrong could mean you damage your material, produce poor quality work or injure yourself or others. Choosing the correct wheel type is the first step to working safely. Here we look at the six main characteristics of Abrasive Wheels which you need to know about when choosing the right type of abrasive wheel for the job. Having chosen the correct wheel, the next step is to correctly set up and install the abrasive wheel. You need to know which checks should be done and you also need to know how to look after abrasive wheels properly, including handling, maintaining and storing them. In this section, we look at how you do this, from taking an abrasive wheel out of its packaging right through to being ready to use it. We cover ring tests and wheel mounting, which includes flanges and blotters. We cover safety checks and we cover wheel maintenance (including truing, dressing and balancing), handling and storage. This Abrasive Wheel Safety Training course concludes with a 20 question multiple choice test with a printable certificate. In addition, brief in-course questionnaires guide the user through the sections of the training and are designed to reinforce learning and ensure maximum user engagement throughout. Your Abrasive Wheel Training Certificate includes your name, company name (if applicable), name of course taken, pass percentage, date of completion, expiry date and stamps of approval or accreditations by recognised authorities. Based on 89 real user reviews. Read our full reviews for Abrasive Wheel Safety Training. The main legislation relevant to using abrasive wheels is the Provision and Use of Work Equipment Regulations 1998 (or P.U.W.E.R). Firstly, this document makes it clear that any work equipment and machinery must be fit for purpose. Secondly, it requires that anyone who’s going to use a piece of equipment – in this case, an abrasive wheel - must receive adequate training and safety information before using that equipment. Every employer shall ensure that all persons who use work equipment have received adequate training for purposes of health and safety, including training in the methods which may be adopted when using the work equipment, any risks which such use may entail and precautions to be taken. The regulations deal with the work equipment and machinery used every day in workplaces and aim to keep people safe wherever equipment and machinery are used at work. PUWER replaces the Provision and Use of Work Equipment Regulations 1992, carrying forward the existing requirements with a number of changes and additions. Due to abrasive wheels being incredibly fast moving and having abrasive particles, they have the potential to be very dangerous. Over half of abrasive wheel accidents are due to the wrong type of wheel being fitted and around 33% of accidents are caused by overspeeding the wheel. Both of which could be avoided with sufficient abrasive wheel training. Why is abrasive wheel training required? Every year there are thousands abrasive wheel injuries and the vast majority of them are preventable. 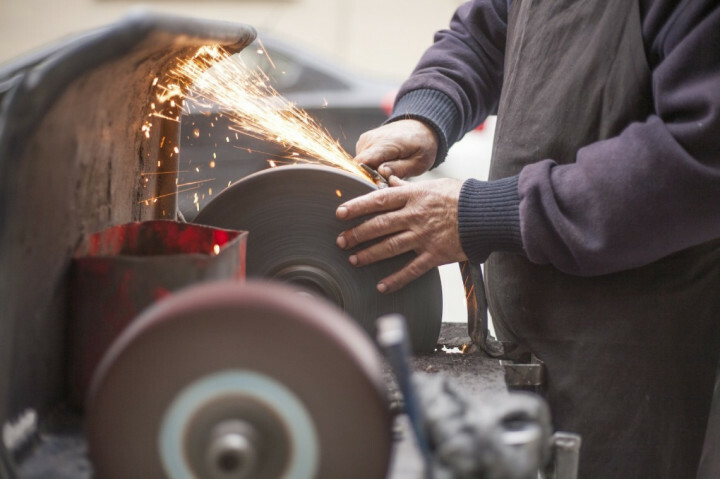 People working with abrasive wheels need to know the types of abrasive wheel and their purposes (to help them choose the correct wheel in the first place), the potential risks, how to use them safely and how to maintain them. Placeholder image for So, why is mental ill-health such a problem in the construction sector? So, why is mental ill-health such a problem in the construction sector?